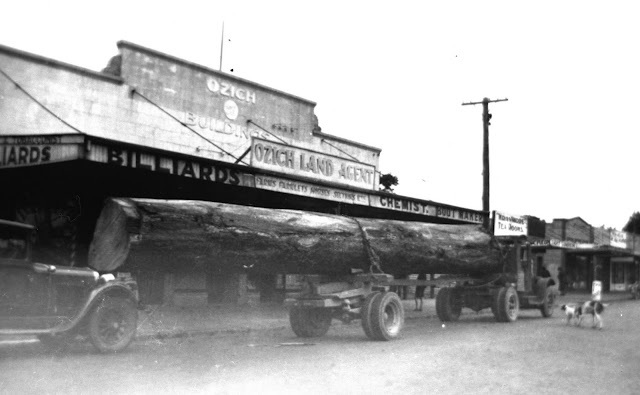 A large part of Jack Diamond’s extensive research on all things West was focused on the logging industry in the Ranges, he gathered images from every source available to him over the long years of his dedicated work on the history of Auckland’s West. The images here are a tiny selection from Jack’s huge collection of photographs. Giant kauri trees were always special enough to be photographed, well before digital or even old-fashioned film cameras were invented, when equipment was quite large and processing the images was quite a task! The tree in this photo is just under 16 metres in circumference. 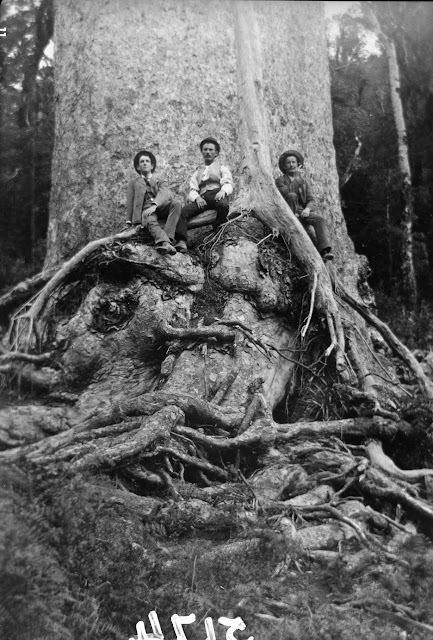 Three men are sitting on top of part of the root system, which is above the ground, of the large mature tree in the Nihotupu bush of the Waitākere Ranges. Ref: Charles Thomas Spearpoint. Kauri log and workers in Mander and Bradley's bush. 1898. Auckland Libraries Heritage Collections, JTD-08D-05589-1. 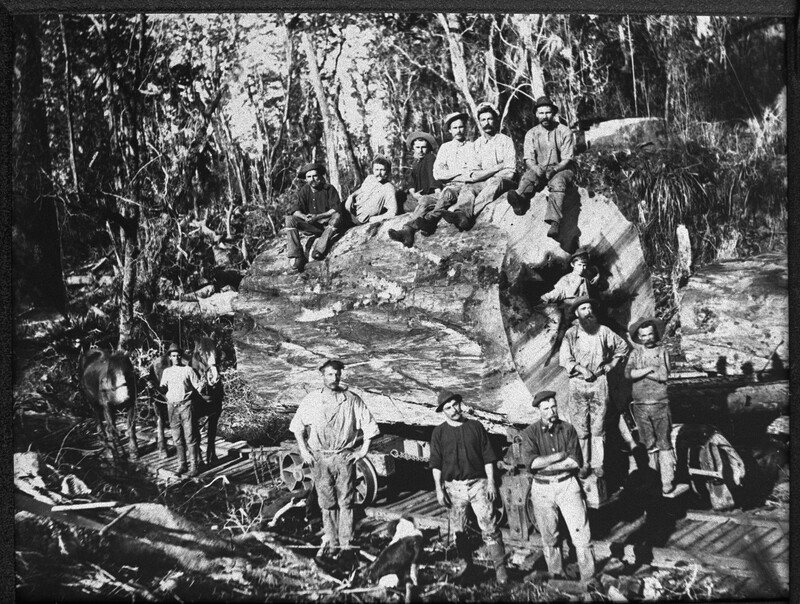 Can you imagine how much hard labour it took for this group of bush workers from Mander and Bradley's Mill to load this enormous kauri log onto the bogie on the mill tramway? The photo was taken in the Nihotupu valley, in the late 1800s. There were no cranes or bulldozers, or helicopters. A big traction engine may have been used to haul the log out. It must have been quite a feat to get it to this point. Ref: Photographer unknown. Pit sawing in the bush up Huia Stream. 1922. Auckland Libraries Heritage Collections, JTD-07D-00329. In the early days bushmen and sawyers worked long, hard, back breaking hours. This log is almost 11 metres long and 1.2 metres thick and these men are cutting it by hand! Pit sawing was the simplest way to produce planks for quickly building huts and dams in the bush. It was also a cheap way to make use of a small stand of trees. A long saw with a handle at each end was used, one man above, and one man below. Two experienced sawyers could produce planks almost as accurately as a machine! Read more about the purpose of this particular pit sawing operation by clicking on the link to the image. Ref: Photographer unknown. Bullocks on a corduroy road. c1920. Auckland Libraries Heritage Collections, JTD-01D-04506. A quick and cheap way of making a serviceable path through wet, soft bush soil was to make a corduroy road. 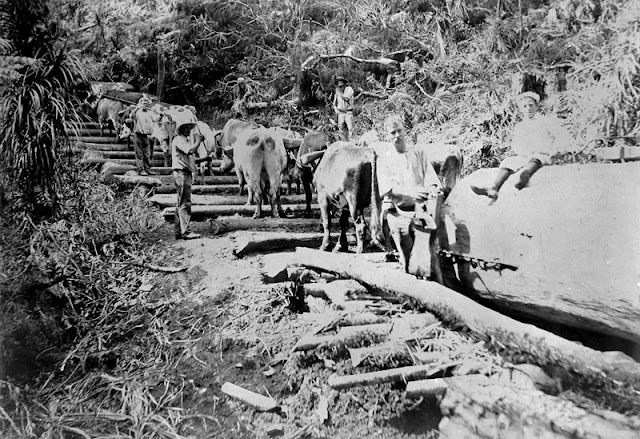 In this photo lengths of logs have been cut and laid to create a durable surface for the bullock team to pull heavy logs from the logging site to the mill tramway. Corduroy roads were built for military purposes too. Ref: Photographer unknown. Piha Tramway, lower section ofthe Piha incline. 1916. 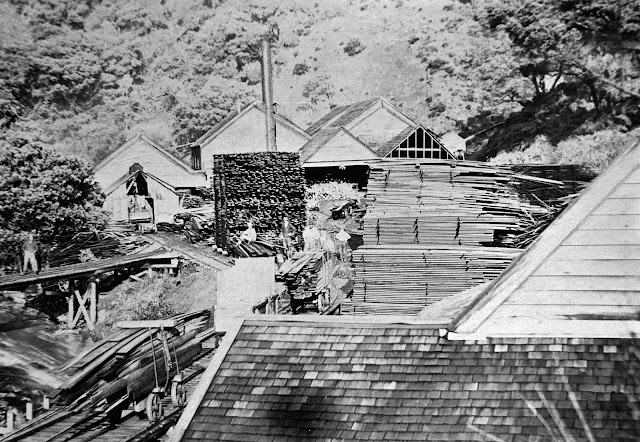 Piha Mill was established at the junction of Glen Esk and Piha streams, but an efficient way of getting the timber from the mill was required for getting over the 900 foot hill to Karekare and then on to the Whatipu Wharf. At the top of this impressively steep rail track was a hauler engine that would pull a load of sawn timber up from the Piha Mill, over the top, and lower it down a similarly steep incline to the Karekare side. Find more information on the Piha Hill and its track in The Piha Tramway by David Lowe. Ref: Louis Marusich. Piha Tramway engine and log on bogie. 1920. 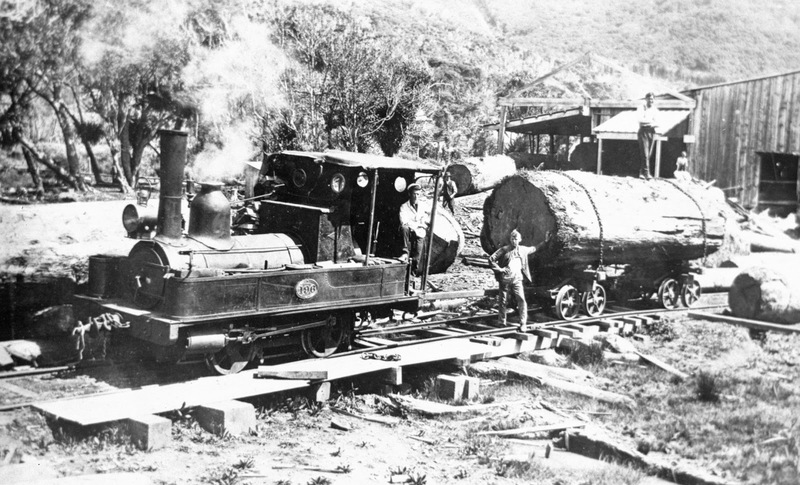 Built in 1873 this A196 steam engine was purchased to accompany ‘Sandfly’ on the Piha Mill logging tramway around 1914. It worked the Piha-Anawhata section of the track. ‘Sandfly’ worked in the other direction from Karekare to Whatipu. 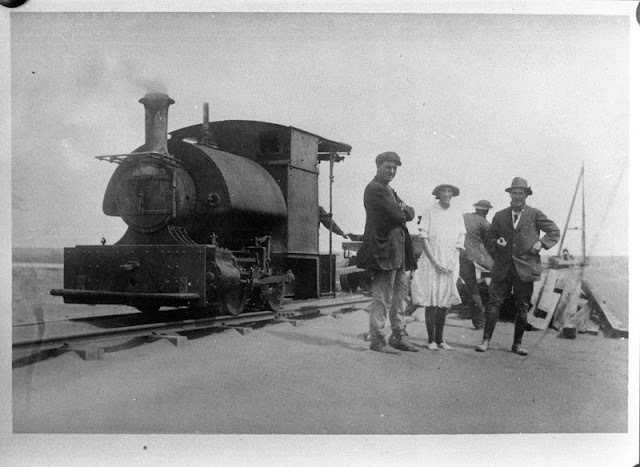 It appears it was never named like the little ‘Sandfly’ locomotive, which acquired its name after arriving on the coast and working on rail tracks across the Karekare sand. ‘Sandfly’ even had its own name plate. Would you like to read more? Click here to request a book about the Piha Tramway. Henderson in the 1920s was a very different looking place! This tough little truck and trailer look barely adequate for the job of transporting this huge log through Henderson in 1926. Perhaps the driver parked outside the Ozich Buildings in Station Road (now Railside Ave) to pick up his boots or have a cup of tea? 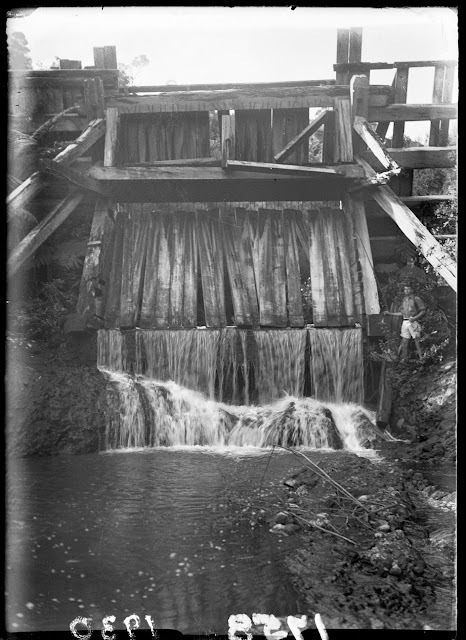 The Glen Esk kauri timber dam on Glen Esk Stream in the Piha valley was built by Ebeneza Gibbons in 1911. It was originally intended to be a driving dam, opened to flush logs downstream. Unfortunately the drop was so high the logs were badly damaged in the fall so it was converted to a holding dam and logs were hauled out of the lake it created and sent down a chute to a nearby stream. This tramper is standing near the almost completely intact dam. This photo taken in the 1940s from a similar perspective shows how it deteriorated over time. 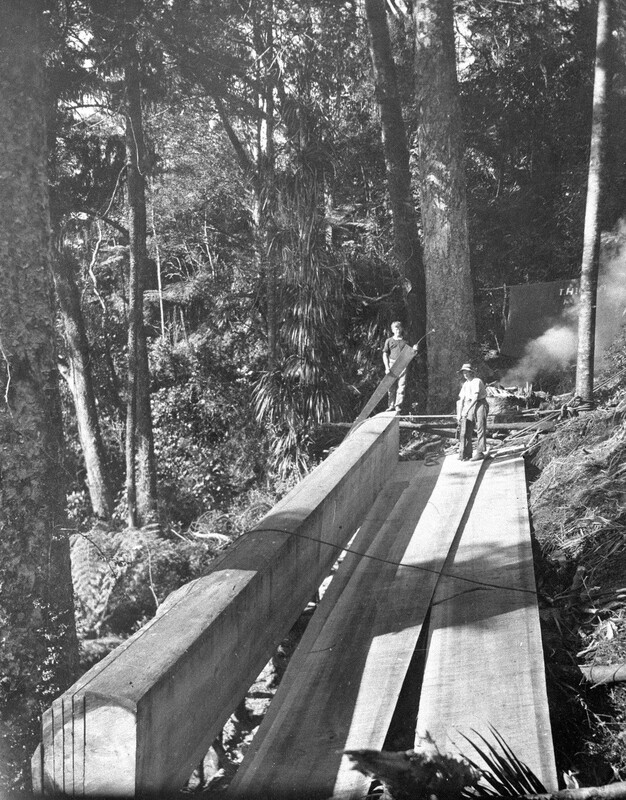 You can see the precise construction and size of this wooden dam and the log holding lake in this photo of two men at the Mokoroa Stream in Goldie's Bush. 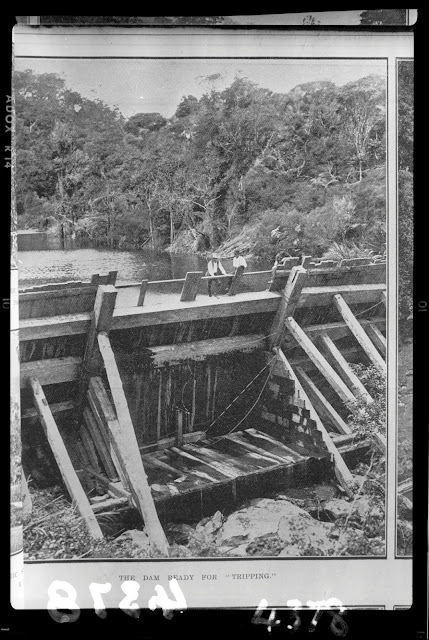 The dams became more sophisticated as time passed as the men who laboured in the logging industry learnt what worked best. Request this book to read more about the construction of logging dams. Photographed from an original image published in the Weekly News, 9 March 1922. 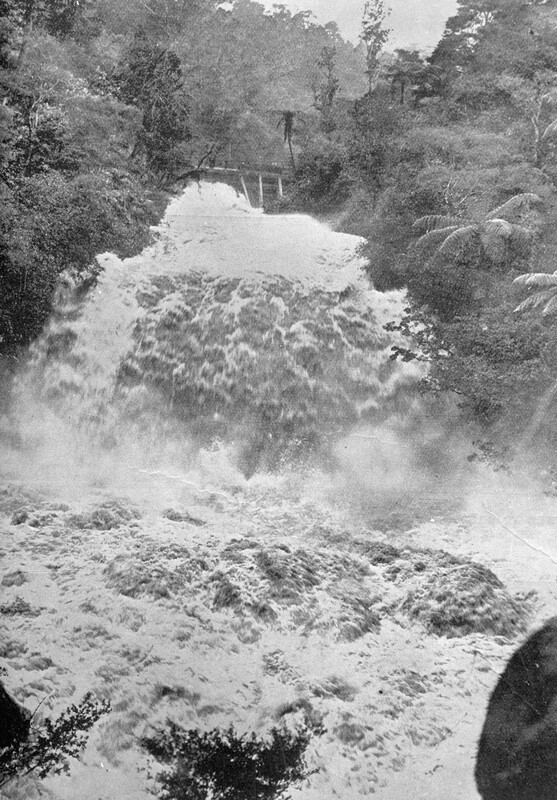 You can imagine the roar of the first rush of water cascading over the Mokoroa Falls after the dam was tripped on the Mokoroa Stream in Goldie's Bush. The water would flush the waiting logs downstream to be corralled and delivered to the mill. Would you like to see a driving dam in action? Contact the West Auckland Historical Society at their base in Henderson, they have a working model dam with real water. It’s best to make an appointment. Photographed from an original image published in the Weekly News, 9 March 1922. Ref: Photographer unknown. Sawmill at Karekare. 1886. 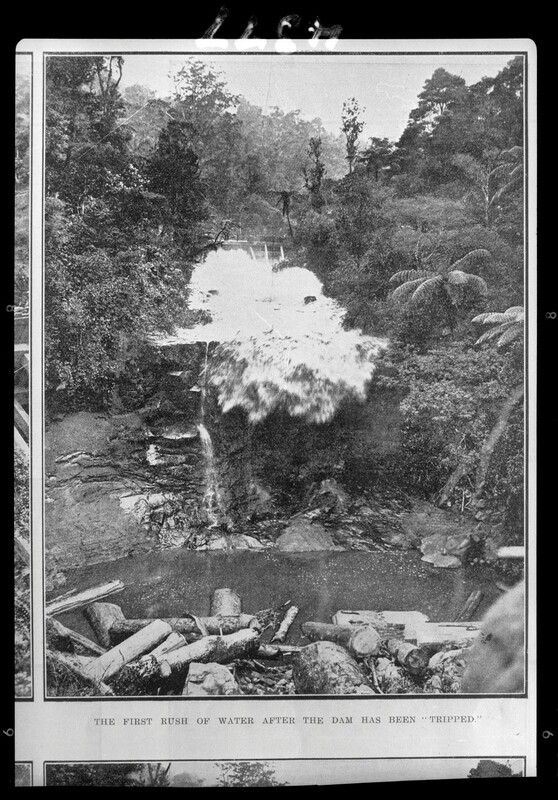 The Karekau sawmill was built beside the prettily named Opal Pools Stream at Karekare. The machinery at the mill was from the Pararaha Mill that burnt down in 1881. Charles Primrose Murdoch managed both mills and one at Whatipu, which he closed and then reused the machinery and manpower to establish the Karekau mill. It was very productive until a downturn in the kauri timber trade and closed in 1886. There’s an interesting chapter about milling in Karekare in the book Rolling Thunder by Bob Harvey. Ref: Albert Percy Godber. Engine on the beach at Karekare. 1916. Can you see the smoke coming from the little engine’s smokestack? Visitors to Karekare would frequently wander down the Piha Mill tram tracks and pose for photos on the working engine, ‘Sandfly’, here sitting on tramway rails on the beach. You can imagine how dangerous it must have been with huge heavy loads of timber hauled up and lowered down the tracks. There were no safety regulations for a working bush railway in those days! Ref: Russell Middlebrook. 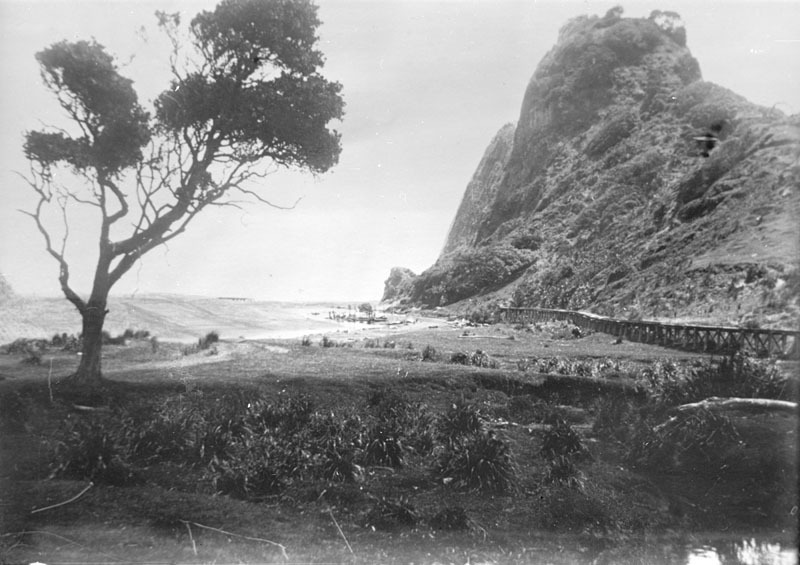 Tramline, Watchman and dunes at Karekare. 1929. But wait! There’s a railway track running along the beach?! This photo was taken in 1929, eight years after the mill the track served had closed. 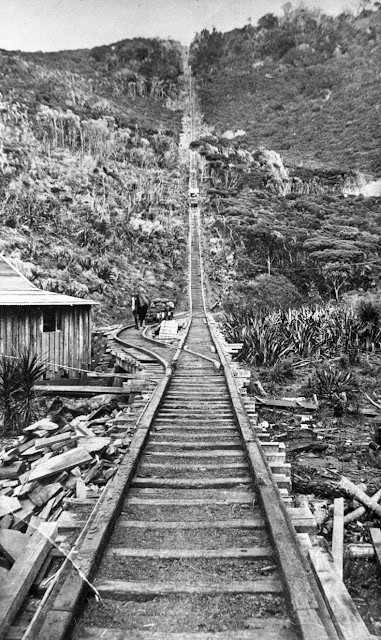 This part of the Piha Tramway was built to make moving logs to the Whatipu wharf more efficient. Before it was built, timber could only be moved at low tide and in good weather. My ancestors came across from New Foundland, Nova Scotia to help develop the land and fell kauri in Huia ranges. These photos provide a real insight into the difficulties and challenges faced by the early settlers to work and survive in what appears to be harsh and very basic conditions. We can be very thankful for their endurance and tenacity to break in the land, create road ways and water ways and small settlements across West Auckland. Being able to construct a dam to capture the rain water is truly a remarkable achievement - and one we can take so easily for granted when we turn on the taps today.